Every student that comes into my studio is afraid of color. It’s like it’s an evil demon. I ask them why they are afraid of it and it honestly boils down to this … they are afraid to make “mud.” Here’s my rule of thumb … even “mud” clay has a place in my studio: undersculpts, bead cores, test pieces, and more. So never be afraid to experiment and have a good time doing it. A long time ago I wrote a beginner’s guide to understanding color theory. It helps break down the “scary parts” of color into things that are easier for us to understand. And of course, Parker isn’t remotely scary to begin with. Today I’m going to show you how my method and how I do it. My method is based on basic color mixing and painting theories. Here’s why I don’t use randomized methods. More often than not, I “accidentally” make a color I really like and want to use for future projects and make large batches! If I don’t know how I made that color, I’ll never be able to reproduce it again. So rather, I make “test colors” from small samples of my basic colors. Yearning for a more random color method? Try Jenny Sorenson’s Pivot Technique. Pick 2 or more basic “blocks” of color – This can be any brand. Most of what I use in my studio is Polyform’s Premo! by Sculpey, but you can use whatever brand you prefer. For today’s example I am using: Green, Cobalt Blue Hue, Purple & Gold. NOTE: I know Premo! very well, so I know which colors happen to be more saturated than others. For example, Cobalt blue hue is a very strong saturated color and will quickly overpower anything it’s put with. I know this because I’ve worked with Premo! for a long time. I would not be as knowledgeable with Fimo and the same may not be true with Fimo. Go easy on yourself when you are first starting to play with color as you may not know the saturations of the color as well if you are unfamiliar with a brand of clay. First condition about 1/4 to 1/2 block of each basic color you have picked to work with. You will need enough clay that you can manipulate and play with. You don’t want to run out and you don’t want to feel like you don’t have enough that you can use. Roll each portion of clay on the 2nd largest setting of your pasta machine. Pick a small cutter to use as your “sample” size and the basic building blocks you will use to make all your test swatches from. – I use a 3/4″ round Kemper cutter. Any cutter you have on hand will work. Note: I don’t like “micro” samples. I like samples that I large enough I can see and “examine” the color properties. Using a 3/4″ cutter will give me a large enough sample size when you combine 2 or more full rounds of color. This also means that I do have enough to make micro canes, leaf canes, small butterfly wing canes, and even kaleidoscope canes in the end; even if I never make larger batches of one color. Cut out rounds of each original color from your sheets you just made using your Kemper cutters. I begin by cutting at least 20-25 rounds of each color I have chosen. This give me enough rounds to play with as I begin to make my swatches. Now the fun part! Take your rounds of color and begin to piece them together to make new colors. Start with one full round of at least one color. Add in other colors, perhaps another full round, or a half round, quarter round, etc. (See the photo above right: the top rounds are the samples I used to make the swatch on the bottom). You can use random rounds of color, half rounds, quarter rounds, it’s up to you. Just play with your main colors you’ve chosen! In addition, I use ALL the clay I have cut from the block before I quit my color blending. When you get tired, you can stop. TIP: If you have a color wheel, I suggest using it so you don’t mix a lot of opposites together and get oodles of mud. I do try to be a little cautious that way. Because I’ve paid attention to my color wheel, all my colors do tend to be “useable” in the end . HINT: USE YOUR CELL PHONE TO TAKE A PICTURE OF THE SAMPLES YOU INTEND TO MIX TOGETHER!! Do this so that you don’t have to remember. In other words you don’t want to inadvertently mix something you already mixed. OR if you come upon a “gem of a color” (something you REALLY like) you can remember it for later; like last week’s Mermaid Teal. Next mix all those rounds or partial rounds of color you have chosen together. Mix and blend them until there are no streaks remaining. Above right & Below: The portions of clay at the top were combined together to make the color swatch shown below. To conclude, at the end of a basic mixing session you will have a few or many colors. The amount of colors you can have increase exponentially with each color you originally selected for your palette. Adding Tints / Tones / Shades : Once my palette is made, I can lighten or darken any color from there. I like my colors to be true. For example, why lighten a purple color when I already know that I can do that by simply adding black or white to that color. Therefore when I make my color palettes I make only what I call “true tone colors” choosing to accept whatever light/dark pigments are already in the clay itself. The ENTIRE palette you see above was made simply from the four colors presented above and in less than 20 minutes by using the method above. 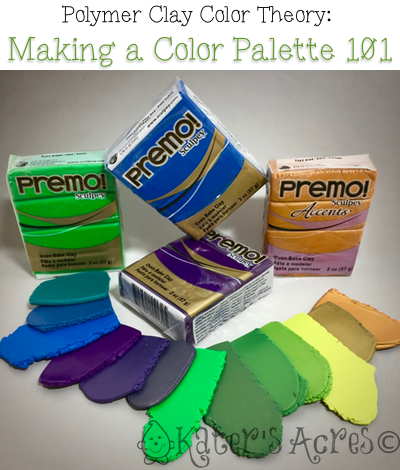 Learning to make a color palette in polymer clay is not hard once you are shown what to do. I have made my own color palettes and blended colors this way for years. I find it easy, and often can come up with some gorgeous new colors I turn to over and over again simply by using this method. Hi Katie, I’ve really enjoyed reading your color recipes. Any chance you’ll post ones for Dark green shimmer and Royal purple fleck? I’m glad you’re enjoying the color recipes. The Dark Green Shimmer and Royal Purple Fleck both will be posted later in the month. Keep checking back! Thanks for asking! Katie…you really got my creative juices flowing. I have always had trouble (been afraid of) mixing colors. Your article inspired me to give your method a try. I had a huge lump of clay left over from a failed project and was trying to figure out what to do with it. I am using this mix (equal parts of gold, copper and pearl) to mix with other colors. I created a beautiful color palette. Thank you soooooo much for this idea. I can’t wait to create some more. I also learned that it helps to use the same base color to make colors that really go nicely together. That’s great Susan! I’m so glad that you found this post so helpful. You will find that this method will never fail you and you can instantly make some gorgeous new colors and quickly too. By making “small recipes” you can find ones you REALLY like and recipes you’ll likely make over and over again. You’ll also find some you may not be too fond of and that’s okay too. Just make sure you keep track! Take pictures, write them down, whatever you have to do. But take my word for it, that LAST thing you want to do is create a FABULOUS color and have NO IDEA how you did it! Wow, Katie – this is one of the most straightforward explanations I have seen. I can’t wait to get into my studio and start playing around!